Peacemaking continues to evolve and takes many forms as each tribe or community establishes and develops a program that is true to its cultural beliefs. Below are some profiles of peacemaking in action as well as some of the best writings that we have found related to peacemaking. The following is a list of some of the best writings on peacemaking as identified by our advisory committee. 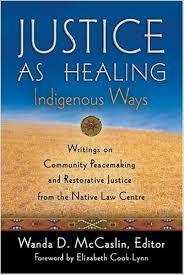 Justice as Healing: Indigenous Ways. 2005. Wanda D. McCaslin, ed. Peacemaking Circles: From Crime to Community. 2003. Kay Pranis, et al. Strengthening Tribal Sovereignty through Peacemaking: How the Anglo-American Legal Tradition Destroys Indigenous Societies. 1997. Robert B. Porter. Yuuyaraq: The Way of the Human Being. 1996. Harold Napolean. Life Comes from It : Navajo Justice Concepts. 1994. Robert Yazzie. The Reawakening of Sacred Justice. 1993. Diane LeResche. Introduction to Tribal Legal Studies . 2004. Chapter 26; Models of Peacemaking. Justin B. Richland & Sarah Deer. The Dynamics of Conflict Resolution: A Practitioner’s Guide. 2012. Bernard Mayer. Intercultural Dispute Resolution in Aboriginal Contexts. 2005. Catherine Bell. A Framework for Understanding Tribal Courts and the Application of Fundamental Law: Through the Voices of Scholars in the Field of Tribal Justice. 2015. April L. Wilkinson. Conflict Resolution: Mediation, Arbitration & Peacemaking: Resource Handbook. 1999. National Indian Justice Center. Restorative Justice Practices of Native American, First Nation and Other Indigenous People of North America: Part One. 2004. Laura Mirsky. To Set Right Ho’oponopono: A Native Hawaiian Way of Peacemaking. 1995. Manu Meyer. The Native Hawaiian Justice Task Force Report. 2012. The Office of Hawaiian Affairs. The Disparate Treatment of Native Hawaiians in the Criminal Justice Systems. 2010. The Office of Hawaiian Affairs. If you would like to learn more about peacemaking, the IPI has worked closely with the National Indian Law Library to create an informational page on peacemaking. That page includes an extensive list of articles, books, and other resources on the various forms of indigenous justice throughout the United States and internationally.